Organizational Units (OUs) are the most fundamental Active Directory entities to which one can link group policies and delegate administrative privileges. Therefore, any error in configuring or modifying the OUs could compromise the functionality and integrity of an entire business unit, its users, computer accounts and other resources. To manage an OU, you need to open the native AD console, locate the OU in the domain, and then perform the desired actions. In case of managing multiple OUs, actions have to be replicated for each OU. This isn't as simple a task as it seems. Although PowerShell commands/scripts could be the alternative, they certainly aren't the best because they require extensive coding expertise. Creating and managing a single OU is one thing; however, when there are strategic changes in the organization like team restructuring or vertical expansion, bulk OU movement becomes inevitable. Also, corporate expansions like mergers or acquisitions require IT admins to perform an endless list of cumbersome processes that include OU creation and modification, in the order of thousands. One can only imagine, but not comprehend the vastness of such an activity. This is why OU management becomes a not so regular, but definitely a critical task for IT admins. Create multiple OUs by keying in the values for the attributes of each OU that you wish to create, turn by turn, and then create them all at once in Active Directory. Create OUs in bulk by using a CSV file; list all the OUs that have to be created, along with all the relevant settings in a CSV file, and just import this file into ADManager Plus to create all the OUs at once. Single OU Modification: Using Modify Single OU, the administrator can choose the OU based on the domain(s) or perform a Quick Search for the required OU and make the desired changes in the attributes of OU. Pre set values for any attribute. Make any attribute hidden, read-only or editable. Set any attribute as mandatory. These templates can also be assigned to help desks for creating new OUs. 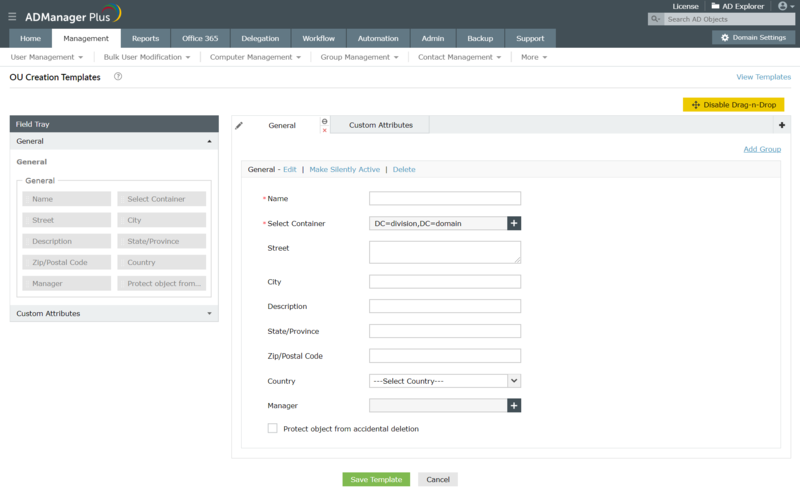 Administrators can set the values for critical attributes and allow the help desk technician to configure only specific/mandatory attributes during OU creation. In the Custom Attribute section, Custom Script feature is available to run on successful OU creation. The administrator can enter the script command in the space provided which will be executed once the OU object(s) is created. Besides taking the excessive load off the administrator's back, these templates also make OU creation an error-free process. 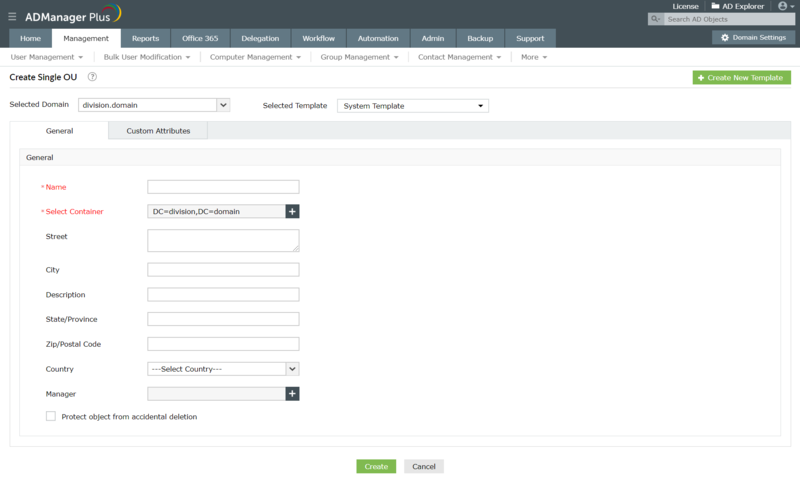 OU modification templates: Administrators can modify the attributes of the OU with the help of a modification template. This allows the technician to modify multiple attributes of an OU, all at once. When these templates are used while modifying OUs, all the attributes of the OUs will be automatically configured with the values specified in the templates. The in-built 'drag-n-drop' functions allows the attributes to be completely customized based on the needs of the technician. Modify OUs via CSV Import: This feature allows you to modify multiple attributes of an OU or a group of OUs at the same time. You will have to just create a CSV file with the names of the OUs that you wish to modify and along with the new values for the desired attributes and import it into ADManager Plus; all the specified OUs will be updated with new values. This simplifies the process of OU modification by a large margin. Using this feature, you can now add the LDAP attribute 'preventDeletion' to the CSV file and set it to be True for 'Protect OU from accidental deletion' feature to be enabled for the specified OU. Move OUs: Using this feature you can move OUs from one location to another, en masse. Just pick all the OUs that you wish to move and specify the destination location; all the OUs will be moved to the new location instantly. Delete OUs feature offers the ability to delete unwanted or unused OUs from the Active Directory. This feature also offers a built-in search option to locate the OUs that you wish to delete. You can also specify the list of OUs to be deleted via a CSV file and delete the OUs all at once.